The Site Menu is the main mode of navigation on your site. This menu allows you to provide links to your photos, built-in pages, custom pages, etc. You can also use this menu to link to an external website such as a blog, your Youtube or Vimeo channel, Social Media Page or any other website on the internet. By default this menu is pre-populated based on the Preset first applied to the site. But if you want other pages or new galleries to be accessible to your site visitors, you will need to add links to those items to the Site Menu. Please note that when new galleries or groups are created in the account, a corresponding menu item will not be automatically added. 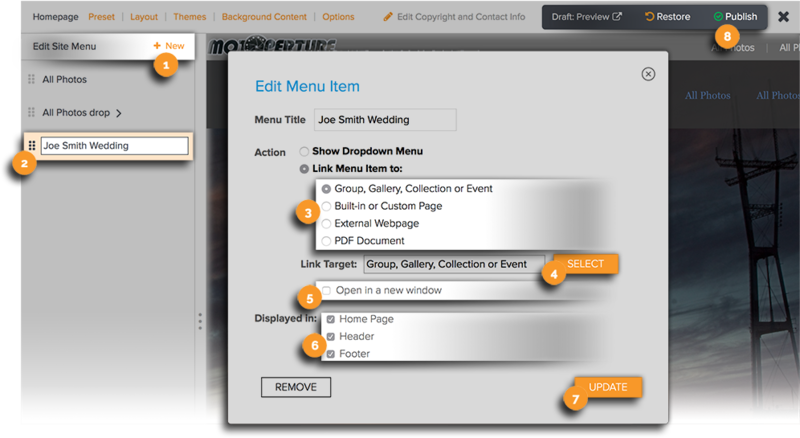 You will need to follow the steps below to create a new menu item that links to that new group or gallery. The Site Menu is edited in Customize Website View. 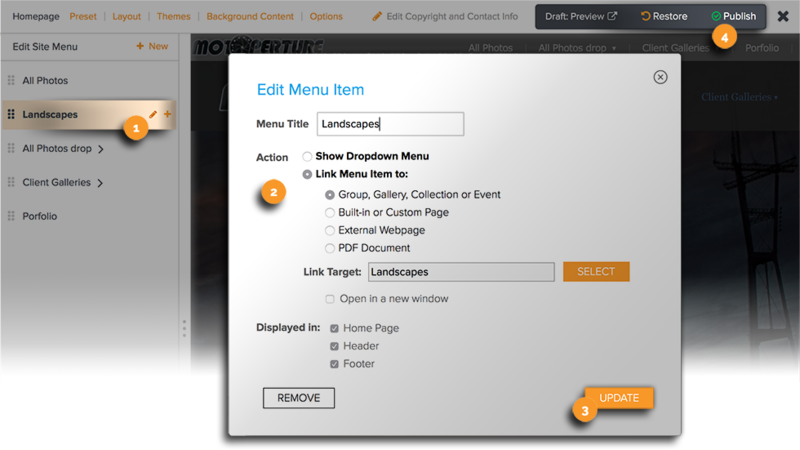 The Edit Site Menu panel will then be displayed on the left of side of the page in Customize Website View. The Edit Site Menu panel is displayed by default but the option is also provided to minimize this panel. Once hidden, it will remain hidden until the photographer choose to show it again. If the Edit Site Menu panel is not viewable, it means that the the Edit Site Menu panel has been minimized and hidden. It can be displayed again by clicking on the three dot icon that appears on the left edge and dragging it to the right. To add a new Link to a gallery, group, collection, built in page, uploaded PDF document, or external web page, follow the steps below. Next to Edit Site Menu, click on + New. A text field will appear. Enter the desired title for the new menu item into the text field. Click Enter or Return on your keyboard. An external webpage (choose this option to create a link to another website outside of Zenfolio). Next to Link Target click Select. A pop-up menu will load with related destinations (group, galleries, collections, custom pages, etc). Select the desired target for the new menu item. If desired, you can choose to check the box for Open in a new window to have the new webpage open in a new browser tab. Check or uncheck the boxes for the areas of your site in which you would like the new item to be Displayed in. Click Update. Your Menu Item will be loaded in the menu directory. Publish your changes before exiting Customize Website View to make those changes live on your site. See the Help section on uploading a PDF document to link to from the Site Menu. You can use dropdown menus to group similar links together in your Site Menu. 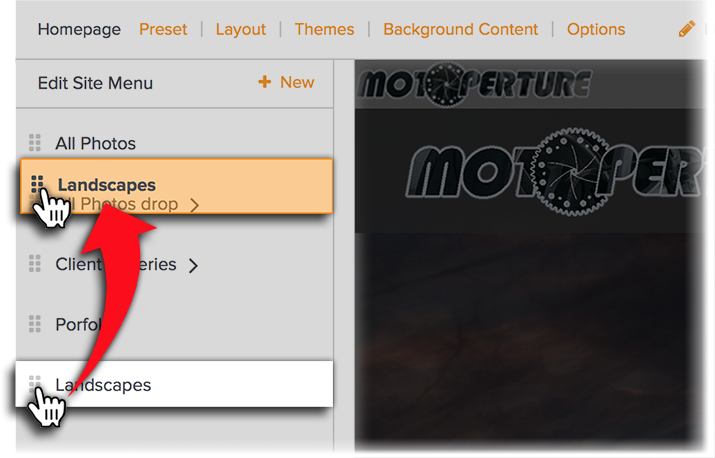 Dropdown menus can also be used to consolidate menu items to save space in your Site Menu. Mark the circle for Show Dropdown Menu. The dropdown menu must be populated with items, or the dropdown menu cannot be applied to the site menu. Next to the dropdown menu in which you would like to create the new dropdown menu item, click on + . Next to Link Target click Select. A pop-up menu will load with related destinations. This may change to a dropdown list depending on what Menu Item action was selected. Click Update. Your new menu item will be loaded into the site menu. Your new dropdown menu item will be displayed under the dropdown menu title and can be moved by dragging and dropping into the desired order. Menu Items that are already in the Site Menu can be edited anytime. Click on the Pencil icon next to the menu item that you would like to edit. The Edit Menu Item panel will appear. Use the options displayed to edit the menu item. Click Update once you've finished editing. ​You can change the order of your Site Menu items by clicking on the grey texture icon to the left of the menu item's title and dragging it to the new location. Click Publish in Customize Website View to Publish the Site Menu changes to your live site.